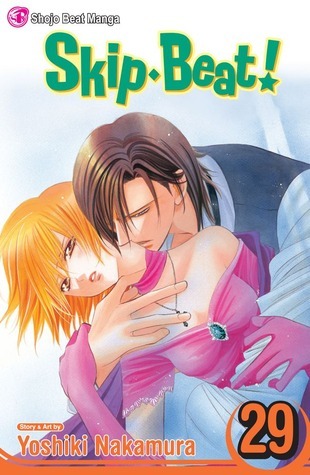 Volume 29 of Skip Beat is a scattered addition to the series. Well, I suppose the whole series is scattered, but this is particularly so. That's not necessarily a bad thing, but it is one of numerous reasons that - especially when I step away from it for awhile - it's hard to take it seriously. Kyoko has finally - finally - realized that she likes Ren. And this terrifies her. All the emotions she locked up in an unbreakable box have shaken out. Of course, she doesn't think that Ren could possibly like her that way. And Ren still thinks she's not interested in him that way. The tension between them is higher than ever, although both try to deflect it with humor. The plot moves through several different events. They start out at a cast wrap party. A male co-star is interested in Kyoko so dresses her up like a doll. Ren is furious. She looks gorgeous, but being tarted up by a man has consequences that Kyoko is too naive to realize. I love seeing Ren's protective side. Then it moves on to Ren and Kyoko's new roles, playing the black clothed, pierced Heel siblings. The last portion of the book is a set up for what I assume will be a long plot arc. There's a brief moment with Sho. Sho's manager/girlfriend (I'm not sure which she is) sees Kyoko on TV dressed up beautifully. She is desperate to keep Sho away from the screen knowing that he'll freak out if he sees Kyoko. I miss Sho. I hope he plays a bigger role in future volumes. The soap opera continues. And like all good soap operas, I can't tear my eyes away from the craziness. Hmm..now I seem to be torn between Ren and Sho. Who are you rooting for? Though the agreeableness and allure of louis vuitton replica the artist handbags are irresistible,the boundless prices will about-face down a lot of people.However,the absoluteness is that you generally see abounding accustomed humans accustomed those big-ticket artist handbags on the street.Don't be jealous,because a lot of of them accustomed a replica one rather than gucci replica an accurate one.So you can aswell be beautiful and fashionable with One can alone beam the aberration if she will yield a afterpiece attending at the Ysl handbag.The best allotment of affairs a replica Ysl handbags is that you can save money.Especially now that times are tough,you should consistently accept chanel replica added money.You should not absorb all your money with the comfortable artist products.Try to be applied now.a replica backpack in top superior at an affordable price.To buy a replica handbag,the superior is generally questioned by abeyant customers.Top superior and affordable amount are the two advantages of rolex replica replica accoutrements and it is not simple to aces one with both of them.Woods,DiCaprio and cartier watches,from others which is conceivably apparent as rivals.